Amazon Web Services, the enterprise division of the e-commerce and cloud services giant, has been growing its reach in data warehousing and big data analytics by way of Redshift, a hosted product that it launched in 2012 and is now AWS’s fastest growing product “ever”, according to CTO Werner Vogels. Along with input from AWS’s own in-house engineering teams, it turns out that at least some of the product’s development came by way of an acquisition. In May of last year, Amazon quietly acquired Amiato, a startup that built a platform to extract unstructured data from NoSQL databases and migrate it to Redshift, creating structure so that it could be analysed with Amiato’s technology or other business intelligence tools. A possible acquisition was first reported earlier this month by Bloomberg. While we’ve been waiting for both Amazon and Amiato’s former CEO and co-founder Mehul Shah, along with several other people we have contacted to come back to us with a direct confirmation, we’ve found the evidence to prove it. 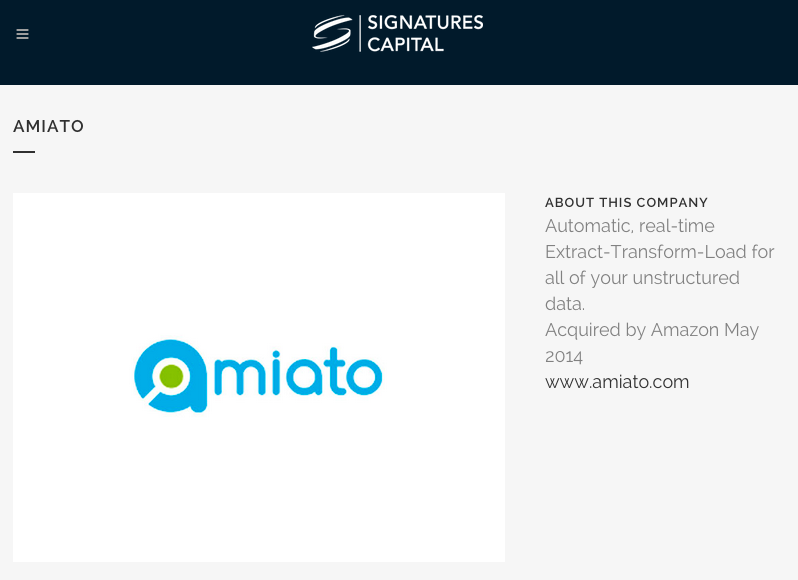 One of Amiato’s investors, Signatures Capital, lists Amiato as a successful exit. “Acquired by Amazon May 2014,” it notes. And several (but not all) of Amiato’s former employees now list themselves as working at Amazon or AWS (here, here, here, here and here). Amiato’s Twitter account, meanwhile, has not been updated since 2013, although there is no indication on the site that it the service is no longer operating. Amiato — which was incubated under another name, Nou Data, at Y Combinator in 2012 — had raised $2 million, with other investors including Bobby Yazdani, Data Collective, Andreessen Horowitz and Ignition Partners. However, as one observer seems to describe it, the company hit a hitch before it launched: it was essentially developing the same product as Amazon Redshift’s data warehousing service, just before Redshift launched. When Amiato did eventually come out of stealth in March 2013, it pitched itself as a big data A/B testing platform for semi-structured data. Given that there are a number of former Amiato employees and founders now working at Amazon, it seems like the move was made both as a technology and talent acquisition. As interest has continued to grow around how businesses can make the best use of the huge troves of data that they are harnessing in their businesses, Amazon has put a lot of effort into making sure that it is at the center of that trend, and Redshift is part of that strategy. AWS doesn’t make lots of acquisitions, but it does so when it makes strategic sense. In March, Amazon acquired a startup called 2lemetry to build out AWS’s Internet of Things technology. We’ll update the post as we learn more.